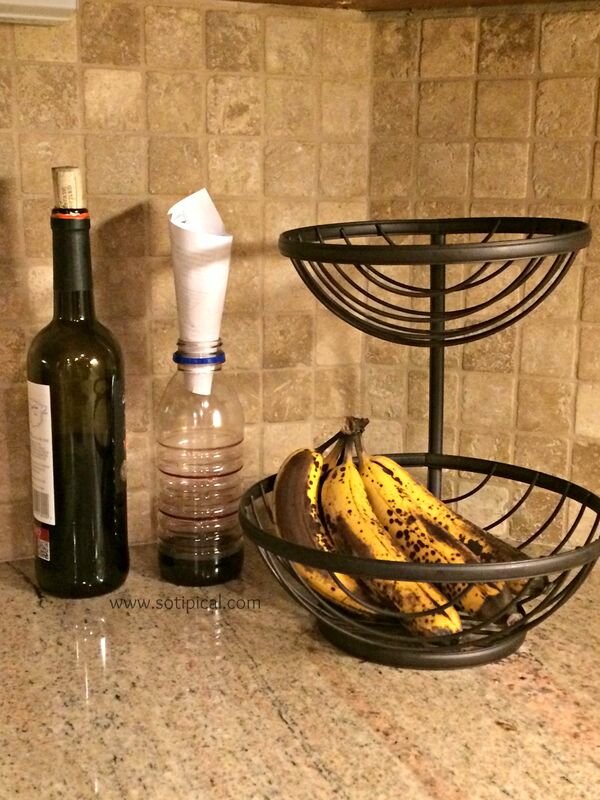 Here are a few tips o how to avoid fruit flies in your home. First, its important to know where they come from. 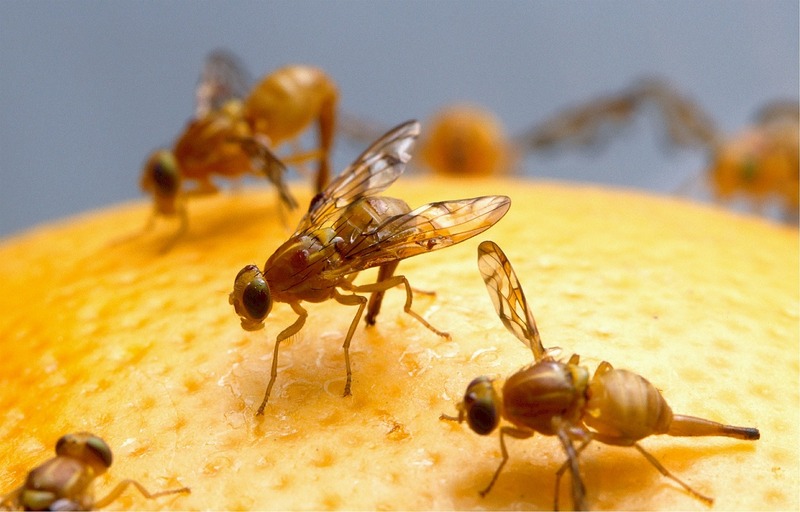 Fruit flies lay their eggs on the surface of fruit that is beginning to ripen. One place likely to hold the eggs is where it was picked off the stem. Once the fruit becomes overripe, the larvae is attracted the fermenting juices that begin to seep out. They burrow inside the fruit and feed on the juice and bacteria that begins to grow. I have to admit that when I discovered this, I suddenly started thinking about when I let my bananas get very ripe for baking and it kind of grossed me out. So how do you avoid this? Wash your fruit as soon as you bring it home! Whether organic or not, fruit really should be washed after purchase. Its always a good idea to wash fruit since most found in the grocery store have been sprayed with pesticides. When I buy organic fruit and veggies, there is often dirt on them that needs to be removed. Plus, whether you buy organic or not, there is likely to be fruit fly eggs somewhere on the surface of the fruit. I have seen produce wash for sale at the store. Of course you can choose to use that, but my preferred method is to fill a large bowl with cool water. If you have lots to wash, you can also plug a clean sink and use that too. Then I use a 10:1 ratio of white vinegar. 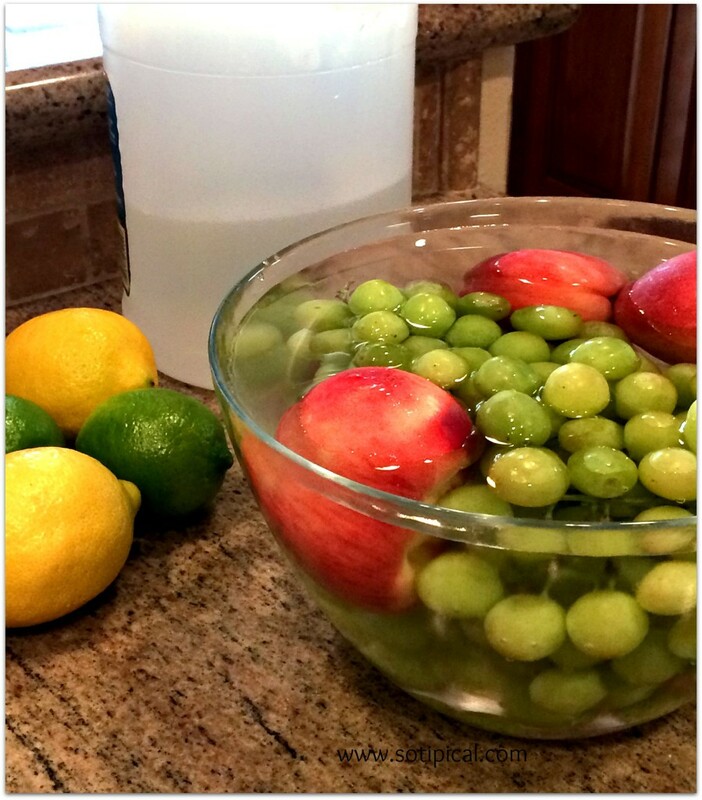 Mix the vinegar into the cool water, then add your fruit or vegetables. Personally, I choose to wash my fruit and veggies separately. Mostly because the fruit if more delicate and some of the vegetables are bigger and heavier, so I try to avoid bruising. For bananas, I haven’t soaked them, but I have rinsed them and use some diluted vinegar to clean the stems. Don’t forget your melons too! Even if you don’t soak them, rinse them off well and be sure to clean the ends where eggs may be hiding. Drain the water and lay the produce out to dry on a towel or paper towel. Cleaning your produce with the white vinegar will also help to prolong the freshness and it will last a little longer too! There is always the chance that you missed something and you may still get some fruit flies, but they should be significantly decreased. Here are some ways to get rid of them, once hatched. Fruit flies are attracted to red wine. Add a small amount of wine in a bottle or jar. Make a cone out of paper and insert the small end into the bottle. The fruit flies can make their way down, but won’t be able to get back out. You can also use unfiltered cider vinegar. They are attracted to this as well. I didn’t really catch any, but then again, I only saw one or two fruit flies. Maybe the opening of the cone was too big and they were able to escape? 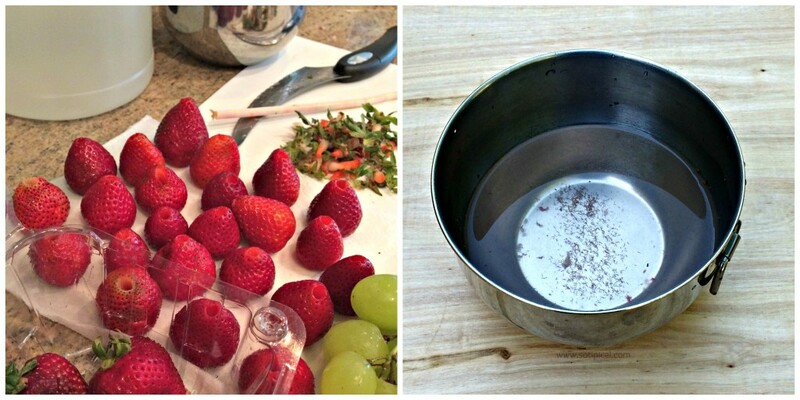 In a small bowl, add some vinegar and 3-4 drops of dish soap. The soap will break through the surface of the vinegar, so the fruit flies will sink below. I haven’t tried this method yet, but it will be next! Place a slice of very ripe fruit in a jar. Place a paper cone with a very small opening in the mouth of the jar. 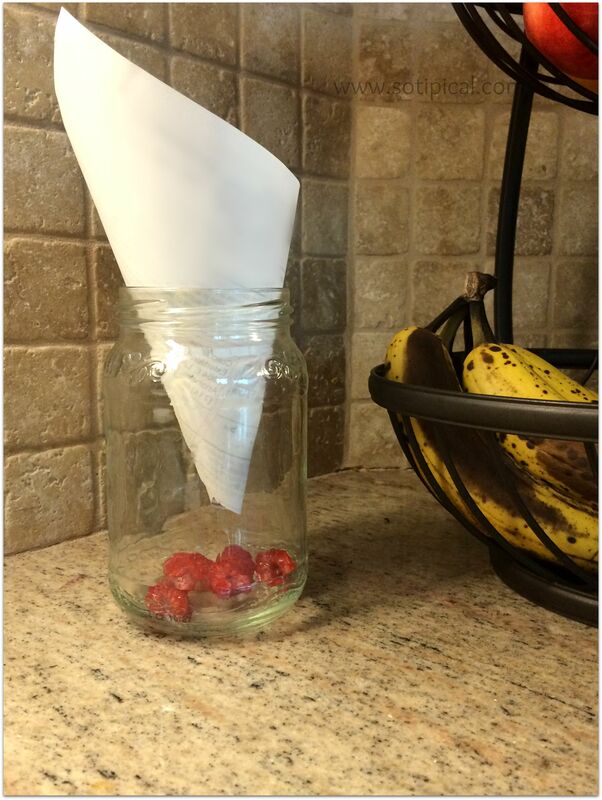 The fruit flies will be attracted to the fruit and won’t be able to find their way back out. I caught one so far. Have you tried any of these methods? Do you have any other methods that have worked for you? Let me know in the comments! These are great suggestions, I will be giving them a try the next time I see one of those pesky flies show up. Thanks.